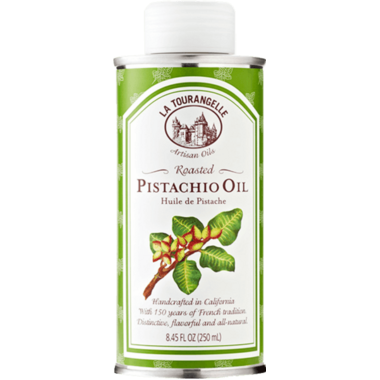 La Tourangelle handcrafts this Roasted Pistachio Oil in Woodland, California strictly following 150-year-old French traditional methods because they believe using traditional methods is still the best way to retain all the flavours, nutrients and health benefits that nature provides. Health Benefits: Pistachio Oil contains low levels of saturated fat, high levels of monounsaturated fatty acid, decent amount of linoleic fatty acid. This combined balance can help protect your heart and fight against bad cholesterol. Ingredients: 100% PURE PISTACHIO OIL. MAY CONTAIN: TRACE AMOUNTS OF TREE NUTS, SESAME SEEDS, AND PEANUTS. Very nice oil for salads. Has a nice flavour that is not overpowering and nicer than olive oil. Very fresh. A good pistachio taste, great for salads!